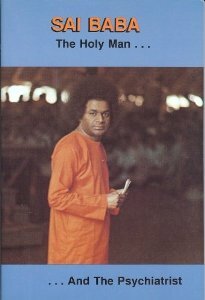 When, as a young psychiatrist, I 1st heard about Sathya Sai Baba, I was most intrigued by stories about his miracles. I was looking for a sign that humans were in fact capable of heightened powers as described in the lives of saints and yogis. I thought that the only way I could be convinced of higher consciousness was to see a concrete miracle. In my 40 year relationship with Sai Baba I have seen plenty–and I’d like to share some with you. Let’s start with the account of a “raising the dead,” told by Gopalkrishna, the son the of the Rajah of Venkatagiri. This video was taken on November 22, 2005 at Prashanthi Nilayam. Walter and Elsie Cowan (both now deceased) report their experiences of Sai Baba bringing Walter back from death. When Walter asked Sai Baba if his experience is the same as all people who die, Sai Baba replied “no” and that Walter’s experience was what his mind could grasp. Sai Baba has said that the last moment of life is our most important, and we will go to the place of our last thoughts/experiences. This video clip is taken from the film “The Man Of Miracles” produced by Don C. Como. Vibhuti represents the eternal Atma — what is left when everything transient is burned away. It represents the truth of a higher consciousness that is eternal and all pervasive — our real nature, although we are unaware of it. Sai says that he has come to re-educate the human community to take to the path to Truth, Atmic awareness, the path to peace. POST #7 Here is the vivid recalling with drawings of mother Ganga paying a visit to Sai Baba in 1946. POST #8 Here is the vivid recalling with drawings of Sai showing His third eye in 1947.